New i40 has been engineered to deliver a refined, relaxing and satisfying drive, whether you’re cruising on the motorway or out with the family at the weekend. With improved low-end torque, efficiency and economy, choose from either the 1.7 CRDi 115PS Blue Drive diesel engine, available with a manual transmission, or a more powerful 141PS version available with a 6-speed manual or new 7-speed dual clutch transmission (DCT). Once you're inside the i40 you'll discover plenty to stimulate your senses. Every aspect of the i40's interior has been carefully considered to provide you with a highly comfortable, highly refined functional driving experience. From premium quality surfaces to fine seat fabrics, you'll see, feel and utilise excellence throughout. 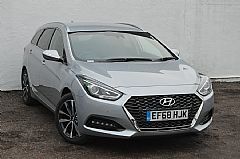 A quick glance at the Hyundai i40 and you can see why it really stands out on the road. That's thanks to its fluidic sculpture design, which ensures it simply looks like no other car in the world. We take your safety just as seriously as you do, which is why the i40 is packed with features to keep you and your passengers as secure as possible. In fact, we've given your safety so much consideration that no matter whether you're the driver or a passenger, you're well protected.